Recently I saw quite a few of these insects in our garden, and of course it begged some research to discover if it was a good or bad guy! They are active in gardens during the summer months. They have a habit of flicking their wings on landing and moving with a jumping motion. I just could not get a decent image so have used an image from Brisbane Insects. The wasps we would generally see are female wasps preparing nest chambers for their larvae. On finding a spider, which may be twice as heavy as itself eg a huntsman the wasp stings and paralyses it and then drags or flies it back to the burrow. She then lays an egg on the spider's body and seals it in a chamber or cell at the end of the burrow. The larva hatches and feeds on the body of the spider before pupating in a thin silky cocoon in the cell. Some spider wasps sting the spider and lay an egg on it and leaves the spider in situ, the larva hatches and eats the spider. 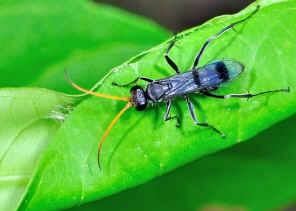 A small number of Spider Wasps steal spiders from other Spider Wasps for their own larva. This behaviour is known as klepto-parasitism.